Uncle Eddy’s Frozen Custard and Mini-golf isn’t glamorous. 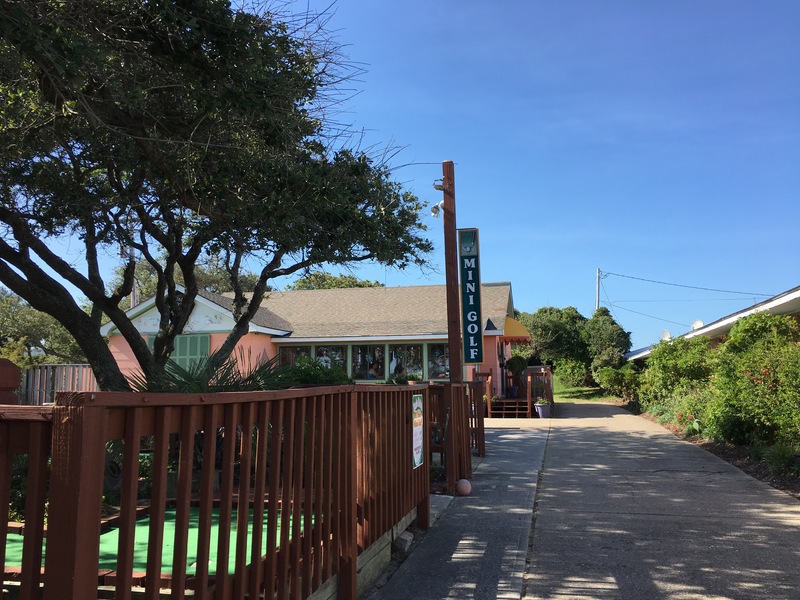 In fact, from the outside, you could reasonably presume it’s a small-town mini-golf place, perhaps with some cheap chain’s ice cream on offer for after your game. But in reality, this place is an absolute must stop in Buxton, NC. You’ll find six flavors of tasty hard frozen custard (next to some flavors they don’t make themselves) with memorable names like Elvis and Spongebob. You’ll also find two delicious flavors of fruity sorbet. 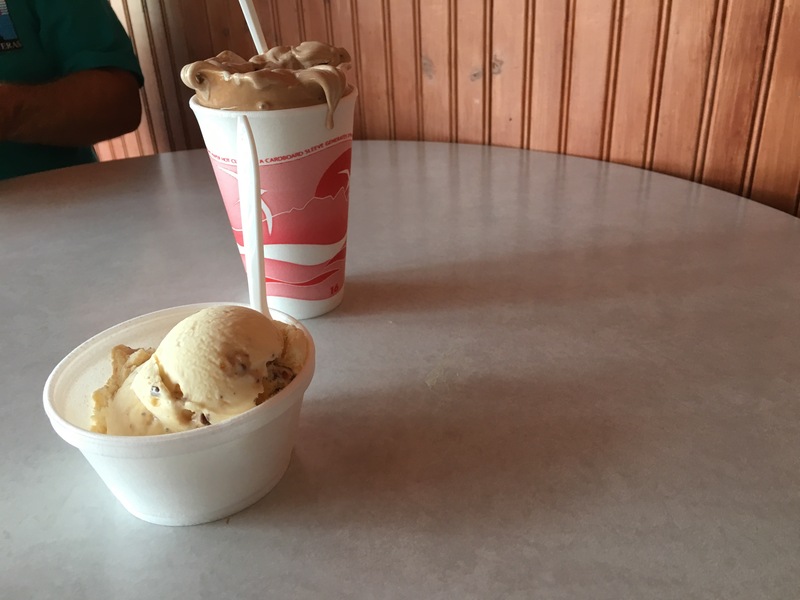 But the reason that Uncle Eddy’s is a must for anyone visiting the Outer Banks is their soft serve custard in chocolate, vanilla and twist. I’ve had excellent soft serve, but it’s kind of an ephemeral thing. 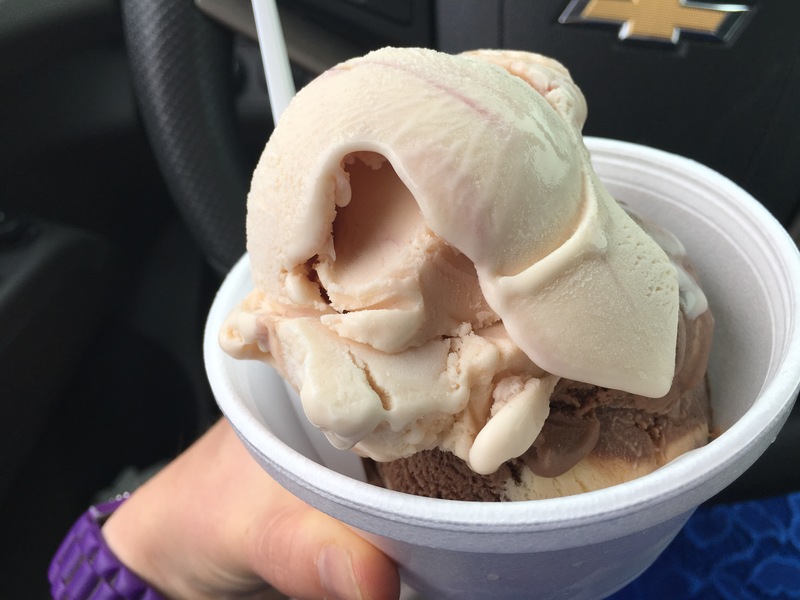 Most places serving soft serve in NH, where I am from, are more focused on it being healthy or low/no fat than it tasting delightfully indulgent. Custard is delightfully rich and creamy, and this stuff is the real deal. I know I should broaden my custard horizons, but to date, this stuff stands as the best I’ve had. If you’re a Dairy Queen fan, you probably love a Blizzard. I used to as well, but they’re really overpriced and the ice cream isn’t exciting. For a nearly comparable price, have a “Hurricane Eddy” with the outrageously smooth and creamy custard you’ll find here. You can get chocolate, vanilla or a twist (my favorite) with two mix-ins. 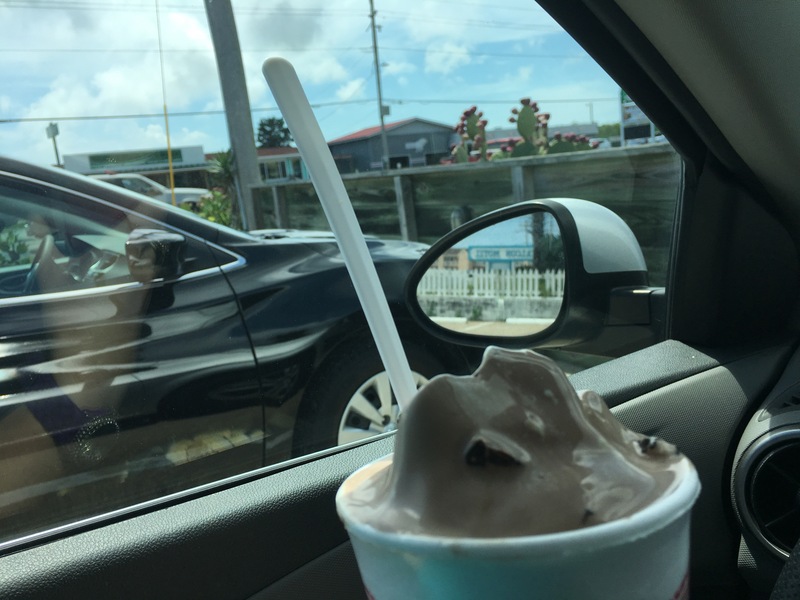 I have enjoyed chocolate syrup and banana, strawberries and chocolate syrup, peppermint patties and chocolate syrup and my absolute favorite, peppermint patties and hot fudge – not a normal option but they offered when they ran out of syrup! This stuff sells for $5.99/16 ounces which is a huge portion. For another buck you can get 20 ounces. I will review for you some of their hard flavors as well. 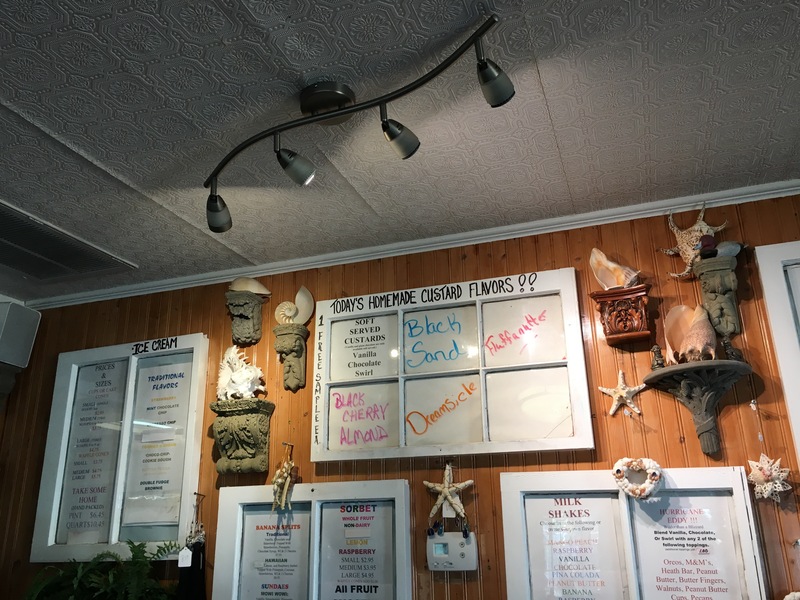 But remember, while their hard custard is one of the best such options on the Outer Banks (next to Scoops in Nags Head and Kill Devil Hills), it’s not necessarily going to excite a city slicker ice cream connoisseur. So have some soft custard. Today, preferably. But if you can make a few visits, here’s your hard custard guide. Black Sand – tasty chocolate base with butterfinger. Yum! Almost a German chocolate base. English Toffee – The toffee addition really makes this one special. Raspberry Margarita – This combines their raspberry and lemon sorbets with vanilla custard and margarita mix. It’s fun and fruity, and like an adult beverage. Kind of sweet and odd, but it’s fun and better and richer than I imagined. Golden Toffee – This one combines vanilla, caramel and Heath bar. It’s seriously excellent and was the best ice cream I had had in a while. The flavors meld perfectly. Lemon Raspberry Cream – This light and refreshing one combines vanilla, lemon and raspberry. Yellow Brick Road – This is a fabulous combination of vanilla, cashews, white chocolate chips and caramel – even if you aren’t fond of cashews! The vanilla is perfect. Hatteras Sunrise – This is vanilla with cherry, pineapple and coconut. It’s so fun and fruity, very candy-like but lovely and bright. Coconut makes me think of a snowball…the finely chopped fruit is well mixed so you get some in every bite. Chocolate Peanut Butter Krisp – This has a chocolate base with peanut butter and rice krispie treats. I’d prefer bigger chunks but it’s fun and tasty. Rice Krispie Treat – A nice vanilla base with treats and caramel. Elvis – This is a chocolate peanut butter ice cream with banana – it’s fun with tasty if cold banana chunks. Golden Toffee – A lovely warm vanilla with delicious chocolate Toffee pieces. Really nice. Be sure to check out their fun beach gift shop. And while I haven’t tried it yet, their shades mini-gold course is very pretty and a bargain at $8/as many games as you want. Bring cash – there’s an extra $1/order charge if it’s under $10 and you use a card. And this stuff is priced well. I first enjoyed a small, 5 ounce serving for only $3.18, and they’re happy to combine flavors for you. If you go, tell them Jamie from Camp Hatteras sent you! They’re wonderful people and I hope they stick around for a long time. Thanks for reading and happy eating! How Much Ice Cream Can You Fit Into a Week? Join Our Ice Cream Community! We'll update you when we post each week. Let the ice cream madness begin!